We bought this set of Boon spoons first – I love the cute design. They are good, but the bowl is shallow and wide so liquidy foods drip off easily and it’s hard to get the whole spoon head in his mouth. But the spoon head is great for scraping dribbles of food from the mouth! The short, fat handle isn’t the best for parent comfort either. 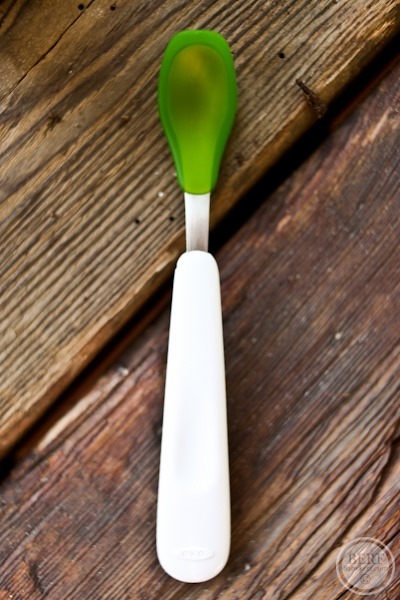 I have six of these OXO Tot spoons in green. The spoon head is narrow and curves up, so it’s great for putting a single bite on the end. Most of it goes right in his mouth. I like the grippy feel to it too – it’s soft for mouth scraping. These are very sturdy and well made. The spoon head is shallow though, so again, drippy foods spill over from time to time before it gets to him. We go through a lot of baby spoons and I needed more so I picked this set of Munchkin spoons up because they were cheap. These are my new favorites. I love how long they are – the “iced tea spoons” of babies – and the bowl is perfect. It’s narrow to fit in a little mouth and deep to contain the food best. 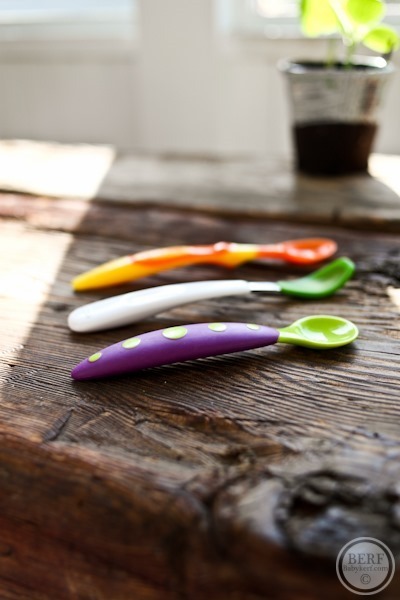 Do you have a favorite baby spoon? 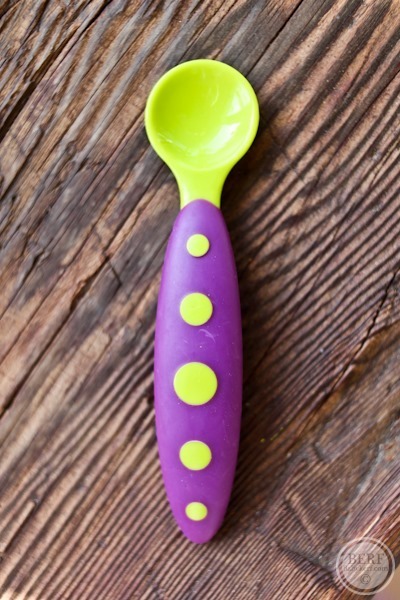 I am a full time live-in nanny for a family with a 14 month old boy, and we love the Munchkin spoons too! We love those Munchkin spoons too! My almost 3 year old still uses them to eat yogurt. You know it’s funny, with my first I did do some baby food (homemade of course!) but I never used baby spoons…it wasn’t long before I realized he liked eating chunks of food better and with my second, I never made baby food once.. These spoons are totally adorable though! They’re getting so fun with designs! I was just about to make this same comment. I’m guessing this order will change as M grabs the spoon himself! The Boon are hands down our favorites now, as chubby and thick is bad for parent hands, but great for tiny toddler fingers. And the shallow spoon is actually easier for him to dig and dip into things. I never use the Oxo ones anymore as they’re too long and narrow for him to get anything himself, but I used to love them! I love the Munchkin ones. I’m on my 3rd baby and just got a brand new set sine the other ones got so much use. My babies always like holding on to them too and waving them around while I get the meal ready. We started to like the shorter ones when they were learning how to feed themselves. We’ve always used the munchkin spoons and my 20 month old fed himself using them. We just transitioned to our regular spoons and he is doing great! 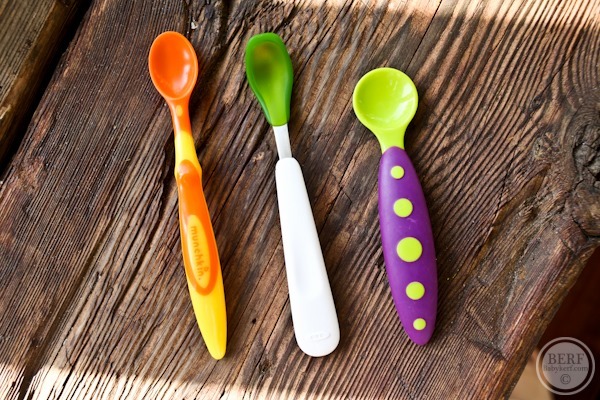 We are fans of the oxo spoon because the bowl is silicone and we are trying to reduce our son’s exposure to plastics. Those are our favorite spoons too! Who knew spoons could take so much thought? One downside of the long spoon, though, is that it’s not weighted correctly, so if you’re using a small bowl (you know, for small servings…) it falls out all the time and makes a giant mess. Improperly weighted utensils burns me up! I vote munchkin too, but agree that later for self-feeding it isn’t the best one. I LOVE it for feeding babies. Woohoo…we are registered for the Munchkin spoons. Glad to hear they are a favorite for mom/dad feeding the baby. I went with Berber spoons. Some amazon reviewers were griping about the munchkin spoons. But I haven’t tried either yet. Next week, rice cereal here we come! I have to agree with you. Charlotte has feeding therapy since she was a preemie and has a terrible gag reflex. The food therapist suggested the munchkin spoons, and she loves them. They are really easy to make sure you can push he tongue down and get the food where it needs to be. I like them because the food comes off into their mouths easily and it stays where it is suppose to. When Mazen gets older the Boon spoons are great for self feeding because of a couple reasons. They are Chunky so its easier to hold in their hands, they have a good grip on the handle so they don’t slip, and some of the boon spoons have a bendable part so that you can bend it side ways so they can get it into their mouths easier. When I nannied for Knox I preferred these for the self feeding because he needed hardly any help at all, and he caught on very easily. Thanks for the great post. MY favorite so far are actually those Gerber spoons with the rubber tips. My baby’s favorite is eating from pouches (I need to get a set of reusable pouches for my homemade baby food!) using a “PouchPop.” She can self-feed with them and has recently even learned how to massage the pouch when all of the food from the top has been sucked out…so cute. 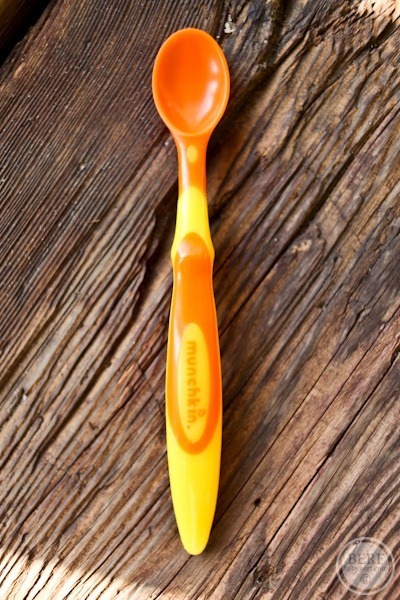 We use the Gerber Nuk spoons – metal handle with silicon-coated tips. Nothing fancy and I never really thought about it much. Evan refuses to eat off a spoon and must eat by himself. Spoons are hardly used. I love how you chose to write a post about this…I’m STILL on a mission to find the perfect cutlery for my son, lol! I’ve tried SO many but none seem to meet my expectations…my son doesn’t seem to mind though so I guess that’s all that matters, right?! Those munchkin spoons are the best! Interesting… We have a whole bunch of spoons, mostly hand-me-downs, including a couple of the Munchkin ones, but we almost never use those. We took a more baby-led-weaning approach, though, and DD is now 2 and mostly feeds herself. They always seemed too long for her to use, and the bowl is pretty small. Glad to know that they work well in some other context, at least. I agree- those munchkin spoons are by far the best! Wish I would of known that from the start! BUT, the search continues when they start self feeding with fork/spoon because these are somehow too long and food dumps out on the way to the mouth. Short and fat seem to be working best for that lately. Thank you for this! Being a newly wed, babies etc. are not really on my to-do list yet, but I was shopping for a colleague’s baby shower and stumbled upon Munchkin spoons here in South Africa and immediately bought it! And it’s quite cheap here as well. This will, from now on, definitely be part of all my baby shower gifts! I do like the Munchkin spoons for practicality and usage, but I find that it scrapes my baby’s mouth when I feed him. I actually looked it up a long time ago when I first used them with my daughter and found it to be a common issue. Perhaps they’ve modified the design, but the spoon part is very wide and indelicate. Good for scraping food around the mouth, but not so great for keeping baby’s lips intact. And I have no idea how I raised my firstborn without a video monitor. The peace of mind alone it offers is worth the extra cost. I’m definitely not a consumer personality, but that’s one of the gadgets I really appreciate, especially when it’s saved my son from a dangerous situation where he rolled over in his swaddle without much noise and couldn’t get his head to the side. That’s the day I wrote the company thanking them for the product.